NH Colla Plus Advance, the enhanced Asian skin-beautifying formula, gives stronger protection to the skin from sunlight (UV rays), eliminates dark spots, lightens scars and boosts the skin’s water retaining capability. This improved formula is a concoction of the most potent skin ingredients. Superior antioxidants like soluble Grape Seed Extract 95% OPCs, Vitamin C fight off the harshest free radicals while marine collagen and nutritious passion fruit juice strengthen the skin foundation to fight against discolouration, brighten skin complexion, accelerate the skin repairing process and regenerate healthier skin cells from within. Made using the latest spray drying technology, it enables deep penetration into the dermis and increases the body’s absorption rate by up to 99%. It speeds up the skin’s repairing and regenerating process to give incredibly fair, hydrated, firm and supple skin in just a short period of time. Results are noticeable on the face and the whole body. NH Colla Plus has long proven its effectiveness in repairing and improving skin. 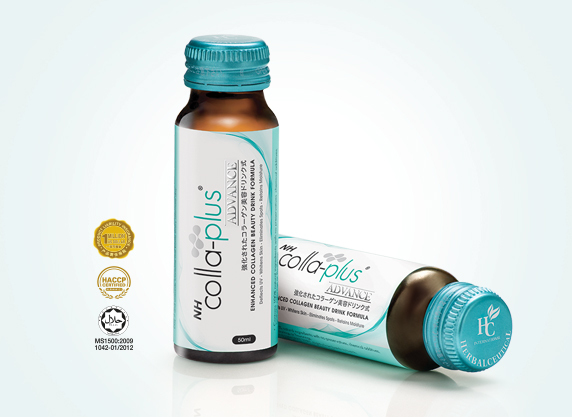 Inheriting the 7 beauty benefits of NH Colla Plus, this new 1+4 formula has enhanced for superior dark spot reduction, UV radiation protection, a higher cellular regeneration and sensitive skin alleviation effect. A five-fold beauty benefit in a single bottle to achieve fair, radiant, blemish free and spotless skin within a short period of time. Darkspot elimination is made more effective as NH Colla Plus Advance eliminates and prevents dark spots from deep within. It repairs and strengthens the skin foundation for lightening existing dark spots and preventing further formation. NH Colla Plus Advance chases away dull and lacklustre skin and gives you radiant, glowing complexion. Just like an external sunscreen, an internal sunscreen is equally important. Daily UV exposure stimulates skin’s melanin production to protect skin cells against radiation from the sun. The produced melanin (brown or black in colour) is transported to the upper levels of the skin and thus, dark spots are formed on the surface. The strong antioxidant properties in NH Colla Plus Advance increases skin’s tolerance against harmful UV rays, protects from photo-induced oxidation and combats discolouration by suppressing melanin production. Complement your sun block effort daily with NH Colla Plus Advance for the ultimate protection. *Long hours of sun exposure can cause 50% of skin cells to be damaged. NH Colla Plus Advance’s soluble Grape Seed Extract (OPCs) content is a natural sun shielding ingredient that has the ability to protect skin cells from UV radiation damage. 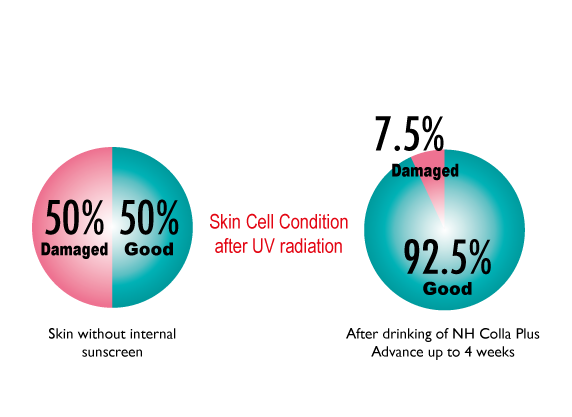 Research shows that NH Colla Plus Advance reduces skin cell damage dramatically by 42.5%. As a great source of antioxidants, NH Colla Plus Advance provides protection to the skin cells from damaging by the external aggressors. Over time, you can expect firmer, suppler and more youthful skin. The power of soluble grape seed extract (OPCs) lies in its ability to enhance the absorption of collagen. It protects and locks it in place so that the wonderful effects of collagen are maximised and become longer-lasting. As a result, the skin is boosted with greater water-retaining capability. Free radicals damage skin cells and cause collagen to break down. 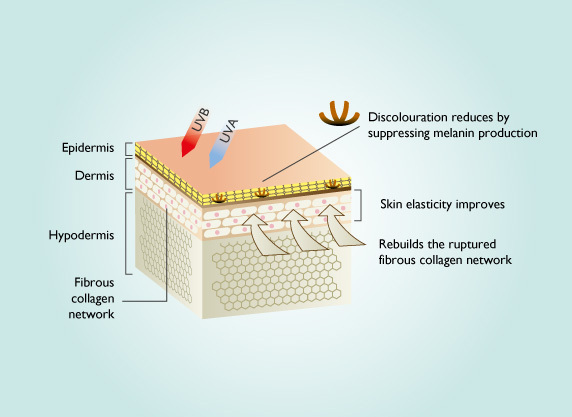 When the collagen matrix of skin collapses, skin becomes more sensitive-prone. NH Colla Plus Advance helps repair and re-structure the collagen matrix of the skin while its soluble Grape Seed Extract (OPCs) help to scavenge free radicals and penetrate deep into the cells to suppress the excretion of histamines. Skin’s resistance to allergens is immediately increased. Struggles with wrinkles, saggy, flabby, dry, dull, oily, acne-prone skin and uneven skin tone. 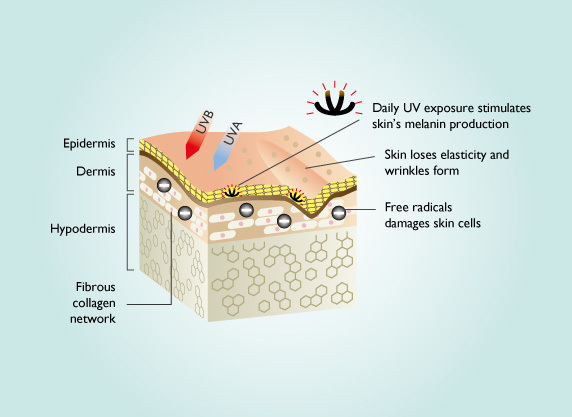 Skin has less tolereance against UV rays and a lower skin metabolic rate. Skin resilience and moisture holding capability increased. Skin problems reduced and melanin production decreases. Skin metabolism back to optimum rate. Skin becomes more radiant and a rosy complexion comes about. The normal turnover period for a beauty drink is 28 days. A shorter turnover period is achievable now with the new NH Colla Plus Advance! Users see improvements within 6 days while noticeable results arrive in just 18 days. Experience the new you after 18 days! Within 18 days, skin looks visibly fairer, smoother, hydrated and radiant. Skin problems are lessened when taking NH Colla Plus Advance daily. NH Colla Plus Advance is made from 100% natural ingredients without added with preservatives and any chemical additives. It is suitable for both genders with different skin types. *In order to substantiate the effectiveness of NH Colla Plus Advance, 4 clinical tests were carried out on 200 Asians (100 men and 100 women) from 25 to 50 years old by the IKODA BIO Co.Ltd Tokyo Laboratory. The subjects were required to consume one bottle of NH Colla Plus Advance daily for 18 days and under close supervision of a panel of dermatologists from the laboratory. Produced using the Spray Drying Technology to enable a 99% body absorption rate for optimum results. 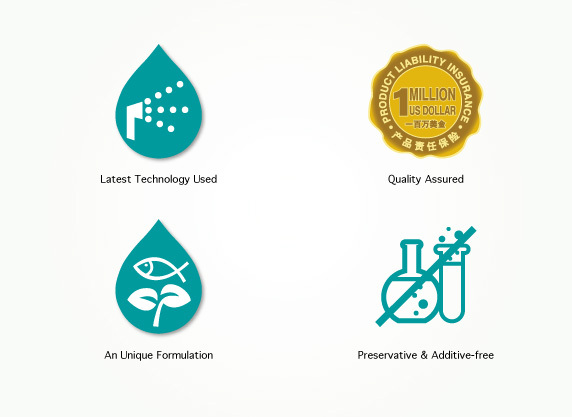 With a Product Liability insurance valued up to US$1 mil (RM3mil), demonstrating an assurance of the potency and safety of its 100% all-natural ingredients with no preservatives, chemical additives and no side effects. Strong antioxidants (Natural Vitamin C and Grape Seed Extract 95% OPCs) work together with collagen and passion fruit juice to promote internal skin health. Devoid of any preservatives, synthetic flavoring, coloring and chemical additives. Carefully extracted from the skin of deep sea fish. Repairs and strengthens skin foundation. Replenishes collagen levels in the skin. Maintains skin resilience and moisture. Protects the skin against UV (Ultraviolet radiation) damage. Protects collagen and elastin from degradation by collagenases and elastases. Stimulates hair keratinocytes (promoted hair growth). Increases skin’s water retaining capability. Soothes and prevents sensitive skin. Good source of vitamins, minerals and fibre. Rich in antioxidants: Vitamin C, Vitamin A, flavanoids. Intensive Method: One bottle daily until satisfaction of results. * Drink on an empty stomach in the morning or before bedtime. 1. What are the differences between NH Colla Plus Advance and NH Colla Plus? NH Colla Plus Advance is the enhanced formulation of NH Colla Plus. It has 1.5 times stronger beauty effects than NH Colla Plus. This enhanced formula provides sun-shielding effects, eliminates dark spots more effectively, gives greater whitening effects as well as stimulates regeneration of healthy skin cells. It gives users more significant results within a short period of time. 2. How does NH Colla Plus Advance help in skin whitening? The whitening effects come from its strong antioxidants content – vitamin C and soluble Grape Seed Extract 95% OPCs. These antioxidants protect the skin against UV damage, suppress melanin production and enhance the metabolism of skin cells. 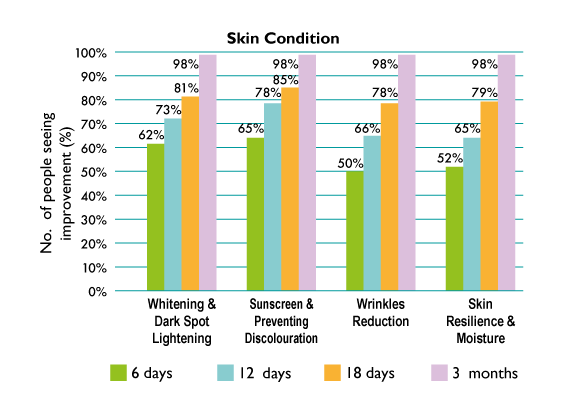 3. Who will benefit most from taking NH Colla Plus Advance? It is ideal for both genders who want youthful, radiant and blemish-free skin. It is especially beneficial for those constantly exposed to sunlight and long hours in an air-conditioned room, keeps frequent late nights and leads unhealthy lifestyles. 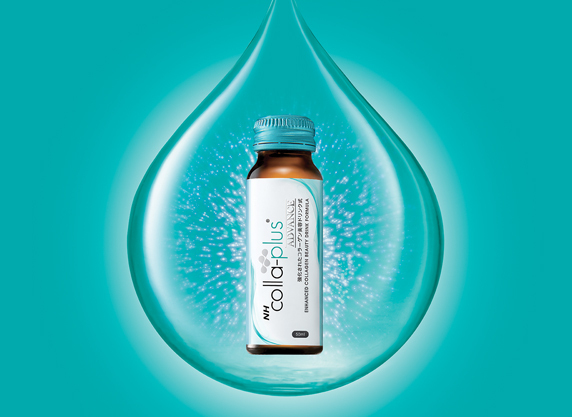 NH Colla Plus Advance helps reduce the signs of ageing and various skin problems such as dryness, open pores, oiliness, pimples and dark eye circles. 4. Should I continue to take after seeing improvements? What will happen when I stop consuming? Even after improvements are noticed, it is advisable to continue taking for lasting results. While the benefits you notice may not go right away after you stop consuming, collagen levels will gradually decline as you age. Besides the natural ageing process, the harsh environment (sunlight, air-conditioned room) and unhealthy lifestyles (smoking, have late nights) will accelerate the rate of collagen breakdown in skin cells. Thus, it is recommended to take 1 bottle every 3 days to maintain the good condition of your skin. 5. How soon can results be seen after taking NH Colla Plus Advance? Results may vary among individuals but generally you can feel the difference after 18 days of consumption (a bottle daily). Skin becomes smoother, more moisturised and radiant. Consistent consumption is recommended for lasting results as well as to see significant improvements in skin problems. 6. Can pregnant or lactating mothers or people with special medical conditions (such as diabetes) take NH Colla Plus Advance? If you are pregnant, breastfeeding or have a special medical condition, consult your doctor before consuming. 7. Should I continue to take during menstruation? Yes, this is because the loss of collagen is higher during menstruation. NH Colla Plus Advance is also safe to be consumed during menstruation as it does not contain hormones. 8. Does NH Colla Plus Advance cause any side effects? No. NH Colla Plus Advance is made from 100% all natural ingredients without any preservatives and chemical additives. It is safe for long term consumption and has no side effects. NH Colla Plus Advance’s new 1+4 formula possesses not just the 7 beauty benefits of NH Colla Plus; it has also been enhanced with additional potent ingredients to further strengthen its skin-beautifying action to provide users with more significant results. Grape Seed Extract 95% OPCs used in NH Colla Plus Advance is water soluble, making it highly absorbable by the body (up to 99% absorption rate), giving you the maximum benefits of OPCs. Low grade grape seed extract is ordinarily not water soluble and has less health benefits to the body. Vitamin C (Ascorbic acid) is a water-soluble vitamin. It is responsible for producing and maintaining collagen, which strengthens our skin and other connective tissues. Vitamin C is also a strong antioxidant that helps fight against cellular damage caused by free radicals. Together with Grape Seed Extract (OPCs), skin is doubly shielded against UV stress and harmful free radicals. This is key to why NH Colla Plus Advance gives users fast and significant results in just a short period of time. Extracted from the skin of deep sea fish (the non-polluted source of fish) and produced using the Spray Drying Technology, this collagen enables a 99% body absorption rate for optimum results. While the best collagen dosage for the body is 5000mg, NH Colla Plus Advance is boosted with 6000mg of marine collagen, seeing the introduction of new ingredients. This dosage is found to work best with the other potent ingredients for fast and significant results.